We've been busy for most of the last two months wrestling the city of Kharé into some kind of shape, and while we're still a short way off announcing a release date for the sequel to Sorcery!, we've been talking a lot recently about working with text, and what we discovered over the last two years. 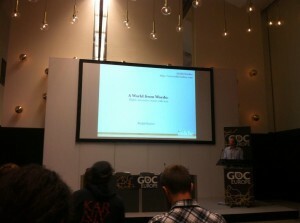 First, we took a trip to GDC Europe to present a half-hour talk about 'making games out of text'. It's a quick trip through creating a choice-based adventure, covering everything from the procedural combat text descriptions to the use of micro-choices to generate reader trust. If that sounds interesting you can watch the whole talk online over at Gamasutra. And if a video is too much commitment, Polygon also wrote up a pretty good summary of the talk, too. The on the publishing side of things, we've written a short series of posts for the Literary Platform about interactive fiction, inklewriter, and how choices play into the reading experience, the first of which is up today. There's some overlap with the GDC talk here, but aimed more at writers and readers; we think that one of the things that made Sorcery! special is that it has something to offer both groups! With the start of the new academic term we've seen inklewriter hitting a few game design courses, and with the recent Choosatron Kickstarter hitting its final stretch-goal, inklewritten stories will be able to be played on the portable text-adventure arcade machine. Enough talking - we'd better get back to work!